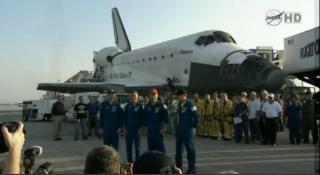 Atlantis' crew stands before the orbiter following a successful landing on July 21, 2011. CAPE CANAVERAL, Fla. — When the space shuttle Atlantis came to a halt for the last time, so did the dreams of all who had fantasized of riding on a space shuttle someday. That doesn't mean, however, that astronaut hopefuls should give up the goal of flying in space. They just have to adjust their idea of how they plan to get there. Though NASA has now retired its 30-year-old space shuttle fleet, the U.S. space agency is certainly not getting out of the business of human spaceflight, its officials say. The International Space Station is set to operate at least through 2020, and NASA astronauts will continue to compose a significant portion of its six-person crew. For its part, NASA is embarking on an ambitious program of deep space exploration. The agency is developing a heavy-lift rocket and crew capsule to take humans beyond low-Earth orbit to the moon, an asteroid and Mars. "If kids are in school right now and want to be astronauts, there's going to be possibly even more opportunities," Walheim told SPACE.com. "With the commercialization of access to low-Earth orbit, that will give people a chance to go to the International Space Station. And then beyond low-Earth orbit exploration, NASA will be right in the front of that. The one thing I can say to the kids is: Don't take a shortsighted time frame; look at the long-term time frame, and the future of American space is pretty bright." Space shuttle Atlantis gleamed in the darkness at it touched down on the Shuttle Landing Facility's Runway 15 at NASA's Kennedy Space Center in Florida for the final time. Atlantis' wheels came to a stop at 5:57:54 am on Thursday, July 21, 2011. A 12-year-old today might be about 20 years away from becoming an astronaut on the normal timeline, which requires advanced training in math and science. "In 20 years, I think some amazing things are going to happen," said retired astronaut Pam Melroy, one of only two women to command the space shuttle. "Would I have loved to have flown the Apollo capsule? God, yes. How cool would that be? But I certainly don’t dwell on it, because I got the opportunity to fly on the shuttle. And they will have other vehicles that they can fly, and I will sit on the ground and be jealous of them." It's not too early for kids who dream of becoming astronauts to start planning for the future. "You must have a degree in engineering or science or math or an appropriate technical field," said retired astronaut Eileen Collins, the space shuttles' first woman commander. "If you want to be competitive to be selected, you must do well in school. If we're going to explore Mars or the asteroids or the moon, we're going to need geologists that also have operational skills. You can learn how to fly, how to scuba dive. And learn a language — I think if you do, it will make you more competitive for the astronaut job." Astronaut Cady Coleman, who recently returned from a long-duration stint on the International Space Station, said that in the absence of the shuttles, we need to make the station more visible to students. "Schools should check in on space stations, you know, just to realize that you don't need to wait for a space shuttle to launch," Coleman said. "People live there. Every day." And children who are inspired by space should also know that becoming an astronaut isn't the only way to get involved. Stephanie Stilson, a 20-year NASA worker who's now serving as the flow director for shuttle retirement, recalled visiting the Kennedy Space Center Visitors Center rocket garden when she was in third grade. "I remember telling my dad, 'When I grow up I want to work for NASA. This is just great, this is so cool,'" Stilson said. "I think about it because you hear a lot of people say, especially the astronauts, that they say, 'Oh, ever since I was little, I wanted to be an astronaut.' And while I would love to be an astronaut, it was funny that I didn't say I wanted to be an astronaut; I said, 'I want to work for NASA.' Because this is what I was seeing; I wasn't just seeing the astronaut part of it, I was seeing all the rockets in the garden." Ultimately, the end of the shuttle is not the end for American human spaceflight. "I'm glad to share this historic moment with them," Fincke said, "and I'm also trying to get them to understand that this is the closing of one page and the opening up of a new chapter of where humans are going, and I'm looking forward to being part of that team." You can follow SPACE.com Senior Writer Clara Moskowitz on Twitter @ClaraMoskowitz. Managing editor Tariq Malik (@tariqjmalik) contributed reporting for this story. Visit SPACE.com for complete coverage of Atlantis' final mission STS-135 or follow us @Spacedotcom and on Facebook.